Last month I've learnt how to make a new drink. It is milk and date shake! 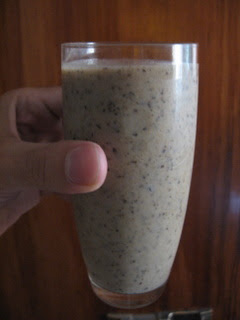 I will call it so to be inline with milk and banana shake which I enjoyed greatly since my early childhood. I learnt this new drink only last month upon my visit to a young Egyptian guy who has taken 6 feddans (around 6 hectars just a bit more) of land in Wadi El Natrun which is in the Western Egyptian Desert. The interesting thing is that this guy had no electricity in his land yet recently bought a small generator that works on gasoline. He also bought a blender which he plugs into electric outlets from that generator. The more interesting thing though is that this young guy has improvised to make such wonderful drink. He had never heard of it before nor had he tried drinking it in the past. 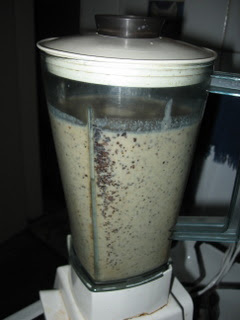 He just set on to try and added dates (after removing the seeds of course) to the blender with some milk and found that it tasted wonderful! I tried it there, and indeed was amazed with the taste! He used powdered milk, yet when I went back home in Cairo I made it with fresh milk instead and it tasted just the better. Here is how it is done: Remove the seeds from dates (preferably soft dates) and put them in the blender without moving their outer skin. Add milk. Start the blender. That's it. This method results in a highly sweet drink so you may consider adding water to make it more sutable for your palate. By the way, this is no traditional Egyptian drink and the great majority of Egyptians don't know it. My mother was astonished when I first told her about it but was delighted after she tasted it for the first time. Yet in Egypt and other Arab countries we have a traditional drink/food which is basically made by soaking dates (seeds removed) into warm milk then leaving them for some time. The result is a really delicous kind of food. It's been knonw for hundreds of years. Yet the shaked version is brand new for us here and does indeed taste great. Perhaps you ought to try it out yourself and see. Remember to add water in order for it not to bee too sweet for you unless you need that much sweetness in your drink. An excellent drink for athletes I guess or for the rest of us after an exercise. 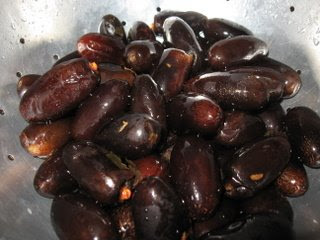 By the way, the type of dates I used is called rotab, it is dark and soft and has an outer skin. 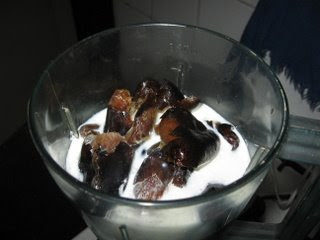 We easily squeze the rotab date out of its black outer skin when eating it yet when making this milk and date shake the outer skin is not to be removed. That was another astonishing thing for me to notice and for my mom as well till we tried the drink by ourselves and found that the outer skin 'disolved' completely into the drink and tasted so good. Nice to see you back. The drink looks great! Hey thanks Patrick. One reason it took me so long was getting fantastic comments on the first posts which made me think too much about writing something for I wanted it to be distinctive. Yeh, the drinks looks and tastes really great indeed! Adding water would be necessary for the most of us though in order for not to taste too sweet. Yet I love it without any water added. Hi, this recipe looks delicious...unfortunately for me I don't think I will be able to find any rotab dates, or any fresh dates in this part of the United States. If I ever find some for sale here I will surely have to try this recipe! Jordan, if you don't have access to fresh dates, then perhaps you can try our traditional alternative: warm milk plus hard dates, leave them for a while to soften in the warm milk, then try it! It tastes amazingly nice. It's highly nutritious too and is a balanced diet. It's funny how something which might have seemed obvious turns out not to have been tried before. It does sound very sweet though! By the way, I tried watermelon in the blender and it turned out to be amazing, though again it's no traditional Egyptian drink (perhaps because it uses the blender). Anonymous, I'm not sure what type of dates you are talking about. Yet "sticky" dates to not seem to be the type used for making a date shake nor suitable for a blender. As for eating the dates instead of giving them a shake the blender we just chew on them then remove the seeds as we do so. The dates used for a date shake have a thin skin that can be easily pealed with hand. They are showed in the photo above. Such type of black dates are originally red or yellow in color then become black as they over-ripen. Such dates are crunchy when they are red or yellow and can be eaten as so and indeed we do eat them in such state in Egypt. Yet when they turn black after over-ripening, they become soft from inside and taste more sweet. We eat them in that state as well. That's the state suitable for using them to make date shake. As for the other types of dates, perhaps you can try them out of the blender with warm milk. I've not tried them in a blender before. Thank you for your answer. The dates are from Medina, Saudi Arabia, are dark brown, and only when I opened the package did I realize that all the dates were very soft and all stuck together in one single blob with seeds all over. I've just had to pull little globs with my fingers to eat them. Still tastes very good. I'll just have to try to simmer them in a little bit of water to see if the seeds can be separated. Being from the Yukon, northern Canada, dates are great to bring for winter camping, as freezing does not bother them. I just drop some frozen dates in the simmering morning porridge, tastes great and gives you energy and warmth all day. Your drink sounds very good. Porridge, it's something I like and your mentioning of it sent my being to a nice place. In Egypt, we have an equivalent of porridge and it's called bilila. It is made from uncrushed wheat. Saudi Arabia and neighboring countries (Iraq being on the top) have so many different types of dates (actually they are different cultivars of dates). I guess I know what you're talking about, soft or let's say chewy dates packed in a cardboard box with the seeds not removed. In Egypt we eat them without any need for simmering, yet in Canada perhaps the weather is too cold (or let's say much colder) which makes them stick together forming large lumps. We experience this same condition when we put them in the fridge here in Egypt. This drink sounds wonderful. :) I hadn't thought of using dates before, but it seems like it would be great. I like to use natural sweeteners in shakes and I bet the dates are sweet enough by themselves. I love practical food that I can make out of things I already keep here. Sadly, we don't have the wonderful looking dates that you do, but I'm willing to give it a try with what I have. Garden4Life, It's nice to use what you have. Sure dates are wonderful and we have them in abundance in our region for its basically a large desert with a narrow strip of fertile land around the River Nile. I too love using natural sweaters, white sugar is a no no for me. 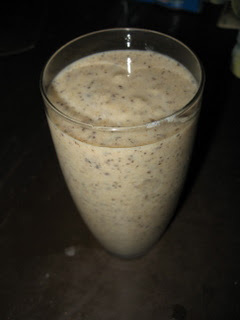 I got a lot of good ideas about dates from reading this post and comments--got to try a date shake, the ideal natural sweetening. It's true, we don't have such a good choice of dates in N. America; I remember being in Morocco and Spain and having my eyes opened to what a date could be. In the U.S., I find medjool dates are the juiciest and plumpest--but this post made me remember the inimitable flavor of a fresh date. Pomona, madjool and similar dates are so nice. Indeed fresh dates in Egypt and neighboring countries have their own different taste and properties. Your comment makes me feel fortunate to have those many types of dates available in abundance and relatively inexpensive. Sometimes when something is so abundant you might not come to appreciate it except after looking at it from other people's eyes. Thanks a lot for your nice and informative comment. Thanks for stopping by my pages and leaving a comment! Your friends drink looks mighty tasty . . . but we can't grow dates here. On your blogs home page, is that a picture of cardoon? I have some growing and they are fabulous plants, I do sometimes add their leaves to soup or stir fry, but a great recipe would be fun . . . So glad you stopped by. Your blog is amazing and deep. It's highly informative and has a special unique twist to it. I've instantly added it to my favorites. Actually I do not know the name of the plant whose photo is at the top of my blog. I took that photo among hundreds of other photos during the Spring Festival at Orman Botanical Garden in Egypt which is held for one month every year there. I guess it is an ornamental plant and not edible, at least according to Egyptian tradition. I loved your closing comment "... but a great recipe would be fun." I wish I had some interesting recipe for the cardoon you have growing at your place. As for dates, I guess it's cool that besides tasting stuff from other places of the world, it's nice to try and eat local and make the best of what's present at one's local environment. It also has some spices in it, though. I think it may have included vanilla, cinnamon, nutmeg, cardamom, and/or allspice. If you like spicy flavors, you might try experimenting with some of these in your milk and date shakes. I'm so glad you're posting again! We've made date shakes for years, after having had one in Death Valley one summer--I suppose date palms are one of the few things that can survive the fierce heat and minimal rainfall there. Of course, ours is a decadent American version, with ice cream as well as milk, so we only make them in summer, and only a few times, as they're very rich. Your post makes me want to try them with just milk, for a cooler-season drink that's not quite so sweet. Lovely comment. Perhaps I ought to try it with ice cream once maybe when guests show up. I have quite a few 'fresh' dates frozen in the fridge as that type of soft dates can be bought only during summer here in Egypt. I'll give it a try God willing. i'm eating some delicious Egyptian dates right now,they are semi dry and not sticky at all with a light inner, unfortunately i have not many left so will have to try this recipe when i get some more,, i must say that Egyptian dates are my favourite so far. I like your post about dates. We buy them from the supermarket and eat them or cut them up and put it in our fruit cake at Christmas. The next time I buy some I will try your drink. I have also done mango, some simple syrup and a little lime juice in the blender and then freeze it for a sorbet, it is delicious on a hot day. Sometimes I add cream to make mango ice cream. That blender is a very handy kitchen tool. Thanks for the recipe--I used to love a banana-date shake at a place we used to live nearby. Time to dust of the blender! The blender is in regular use in the (modern) Egyptian kitchen today. It's interesting to know that one can mix bananas with dates in a milk shake (or perhaps with no milk?) I aught to try that one day. Mmm, I miss the banana shake too!